We provide access to advice, funding, research and networks for community businesses. In 2017, we'll be focusing more on specific places and sectors. As 2017 begins, I want to share with you some of Power to Change’s priorities for the year. Our strategic objectives remain the same: to grow the community business sector, transform places through community business and make the case for community business. Our priorities for 2017 reflect what we have learnt in our first two years and the approach we need to take this year to keep us on track. In our first two years, we funded community businesses right across England, covering every region. We will maintain some of these open opportunities for community businesses at every life stage but will increasingly be looking to focus our funding in certain parts of the country where the conditions are ripe for community business to flourish and our early work has spotted sparks that can be nurtured. By deepening our engagement in this way, we hope to be able to provide more effective capacity building support and better capture of impact of community business on place. We started to explore our role as a place-based funder through pathfinders in Plymouth and Sheffield in 2016 and a series of learning grants to a number of other places. We will have more details to share on our specific target places in the spring. As well as targeting by place, we will also be focusing a growing proportion of our funding on sector-specific programmes where our research identifies a market need or opportunity and we can use our grant funding to catalyse investment by others. We started this sector approach in 2016 with More than a Pub, providing grants alongside loans from the Department of Communities and Local Government. In 2017, we will begin investing in community-led housing, starting in Bristol and Leeds, using our funding to sit alongside the Nationwide Foundation, Esmee Fairburn, Big Society Capital and others. We are exploring programmes in other sectors including energy, sport and health and social care and will have more to share as our scoping progresses. Our annual stakeholder survey, the results of which we will publish in the coming weeks, made it clear to us that this year we need to take community business to new audiences across government, business and civil society, as well as among the general public. A major nationwide study we commissioned at the end of 2016 revealed that 16% of the adult population were ‘very likely’ to get involved in community businesses. Our job is to motivate them to do so. 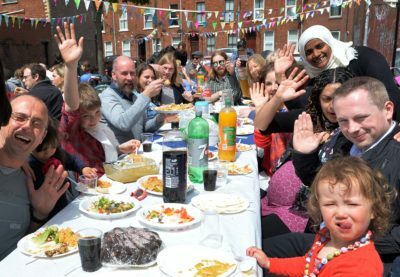 In 2016, we supported the first ever Community Business Weekend to open up community businesses to local people and brought people together at community business shows in Liverpool and Manchester. In 2017 we will use the combined strengths of the media, social media, events and a diverse range of partnerships to start to build greater momentum behind community business as a positive way for local people to take back control of the economic, social and environmental prospects of their communities. Linked to our ambitions for greater reach this year, is a commitment to appeal to a greater diversity of communities and organisations. We are looking at how we design and market our funding opportunities to ensure we have better reach into Black, Asian, Minority Ethic and Refugee communities, disability-led organisations, the Lesbian, Gay, Bi-sexual and Transgender community and others. We see the potential of community businesses to be inclusive civic spaces; indeed our research reveals that those most interested in community business are more diverse than the general population. We will therefore be looking further at the role we can play to maximize this potential. What I have set out here is by no means the sum total of what we will be doing in 2017. You can keep up to date with developments across all our programmes through our newsletter. We are looking forward to an exciting year in which community businesses continue to make an important contribution to the physical and social regeneration of communities across the country.